These were digital to analogue and I/O cards I designed for the VIC-20 computer of about a thousand years ago (even before the Commodore 64). It had 3.5 k of memory (not a misprint) but was an easily understood computer and it was possible to program in 8 bit binary machine language as well as Basic. The VIC-20 had a 5V supply bus which happens to be the same as that used for radio control servos for models. Servos are set to a degree of rotation by a 1.0 to 2.0 mS pulse which could be programmed by the computer using a machine code subroutine for speed. By combining 3 of these servos it was possible to make a printer / plotter and still have a massive 1.5 k of memory left over to program it to do patterns. It was published in an Electronics Today International magazine in 1984. I was a bit niftier with the maths in those days. 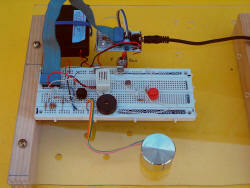 PIC microcontrollers Have been used in a model car as a test bed. This is my PICAXE 08 breadboard to get the idea of simple interfacing. I have also set up a 28A PICAXE controller in a magnetic levitation setup which is under development. Currently to the stage of unstable levitation but limited by the speed of the 4 Mhz processor. Hopefully shifting to a 28X chip which has the pulsout command that runs in the background will fix this.